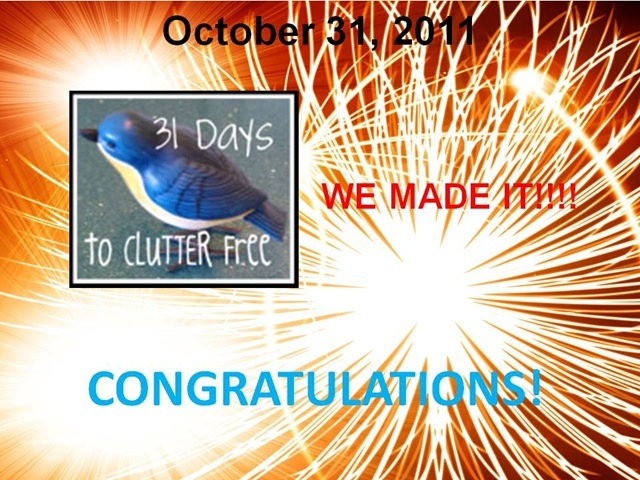 I truly never ever in a thousand years thought I would be saying Welcome to Day 31 of the 31 Days To Clutter Free series. At the end of September when I told my hubby I was accepting the challenge to write a series of posts on a subject I was passionate about every day for 31 days he just shook his head. We both knew it would be hard for me and I am thrilled that I did it. I have all of you to thank. There’s a lesson here. Even if you commit to yourself the added pressure of committing to someone else you is powerful and provides the extra push. We are conditioned to not let others down. So thank you very very much. I heart ya! When I think back about the last 31 days I made great strides in getting rid of clutter in my house and along the way hopefully made a difference for others. I made an eye glass drop off to the Lions Eye Bank, made several donation trips to the Goodwill, and dropped magazines off at the Senior Citizen Center. I rearranged lots of cupboards and closets and even the laundry room is updated. See yesterdays post for pics of some successful organization. I shredded lots of documents that I found I did not need anymore. This series has inspired me. 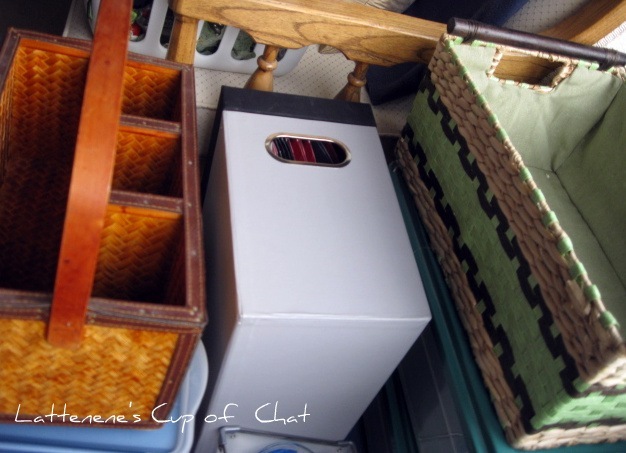 I found out I love to share my clutter free and organization ideas. I’m going to continue sharing ideas with you. Once I have a plan in place I’ll let you know. The easiest way to find out is to subscribe. That way, you’ll get an email every time I post an article. Thanks again for joining me on this journey and thanks to Nester and Melissa and all of the rest of the initial blogging team. What an incredible idea! Below are links to each day. Hi everyone. Welcome to Day 30. I’ve taken a look back over the past 29 days and thought I would recap with some pictures some of the areas I’ve re-organized. Where has all this ended up you ask? Some has been tossed in the garbage, put in books, or used in organizing other areas. I repurposed the small closet in the loft for some of my craft supplies (candy bouquet items and wood items that need painting). 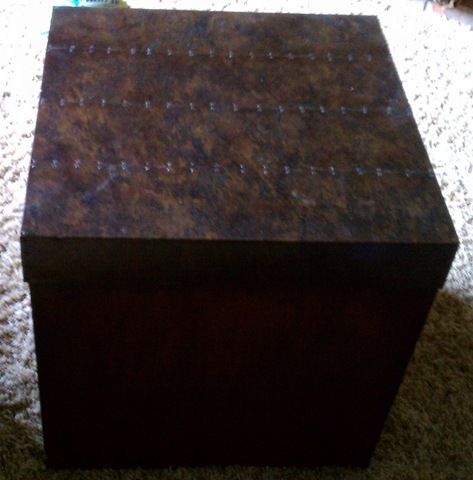 I moved the photos I need to sort through to 3 large decorative boxes, then stacked them to make a side table in my loft. This way, when I’m watching TV, I have no excuse – I can multi-task. The reorganized laundry room is still waiting for a new rug and a paint job but those will come with time. 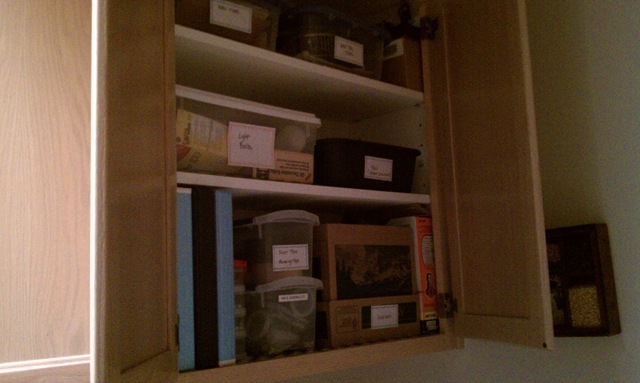 For right now, I am happy with how it looks, especially inside the cupboards. 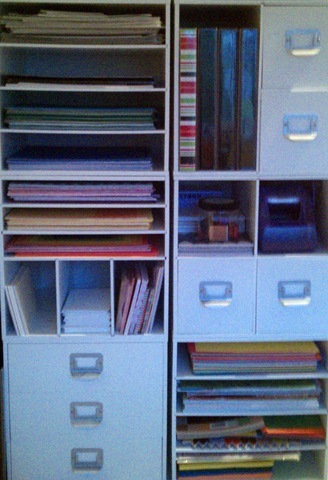 I found an organized space for all my scrapbook paper. Hopefully this gives you some great ideas. I’ll be back tomorrow for one last post in this 31 day challenge…Boo Hoo! Good Morning and Happy Saturday, also known as Day 29! I have to be very honest and say I am so very happy to not live in the NE today because it’s supposed to snow and I am just not a big snow person. In the NW where I live we are having some rainy days and that is giving me the opportunity today to finish painting my kitchen and family walls. My hubby was taping last night in preparation and I was cleaning cupboards, wiping down walls, etc. That’s when it hit me. My kitchen counter is a dumping ground for everything; keys, the dog leash, glass cases, clippers, mail. Shall I go on or are you getting the picture. It makes me crazy and what makes me crazier is I add to the mess. Yes, I am a contributor. IT HAS TO STOP!!!!! IT WILL STOP!!! I am committing this to you. I find that when I commit to others as well as myself I have a better chance of succeeding. I will be clever and thoughtful but I know there are solutions and I will find them and when I do I will share. Whew! I feel much better. 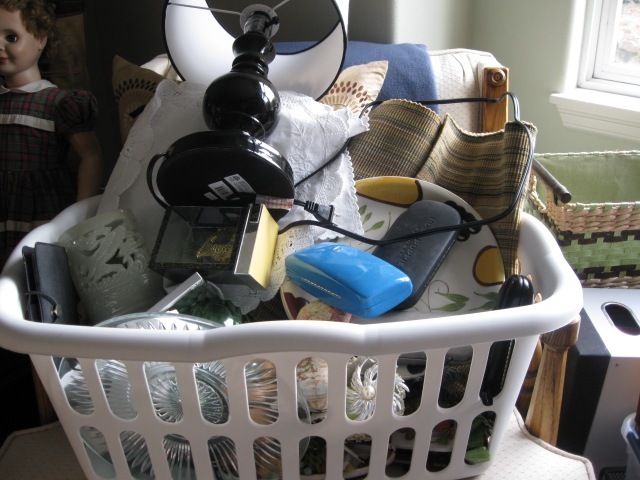 Do you have clutter collection areas in your home? What have you done? Please let me know. I will mull it over today as well but right now I have to go to Home Depot and buy paint. Day 28! Can you believe it? Where has the time gone? So much has been accomplished the last 28 days (will share in tomorrow’s post). But there is still so much to do. Here’s the list of areas I still need to go through. I’ve come to grips with clutter and realized no matter how much time I put into sorting, tossing and organizing, it will creep back if I don’t stay disciplined. That can be a rush for all of us when we’re tired, in a rush, get up late, our kids are making us crazy, anything that takes us out of our normal schedule. The best way to combat this is routine. Get in the habit of sorting the mail before it comes in the house, a 20 minute quick pick-up before going to bed at night, set places to put dog leashes, purses, wallets, backpacks. If your waiting for the microwave to run take 5 and straighten the junk drawer. In other words, I think a little wasted time can always be squeezed in. Five minutes here and 5 minutes there adds up. On another note, how do you like my new header? I put it together at 2:30 this morning. That was after Divot started barking at something and then I couldn’t go back to sleep. Oh well, TGIF! Love my Paddington Bear dressed in his raincoat and galoshes. Had to keep him. 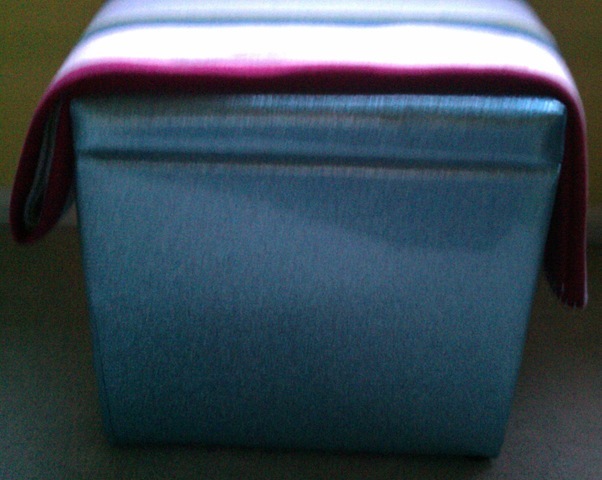 I also like my laundry cleaners and sprays in plain sight so I found a cute basket. Every container labeled = heaven. Organizing clutter makes me feel so good. A completed project just makes me want to do more. Tune in tomorrow to see my list of what I still have to do around the house. I hope your doing well with only 5 days left in the 31 Day challenge. I saved my biggest mess for last, the office. It consists of one large desk and filing cabinet, 2 tall bookshelves and a leather loveseat. The “To Be Filed” box is OOC. That’s short for out of control. The file drawers have outdated info and there are lots of knick knacks that I have avoided for 25 days. I’ve an overflow of school supplies that have not been used since my son graduated high school. He’s a junior in college now. Onward clutter bugs. Onward to Day 25! 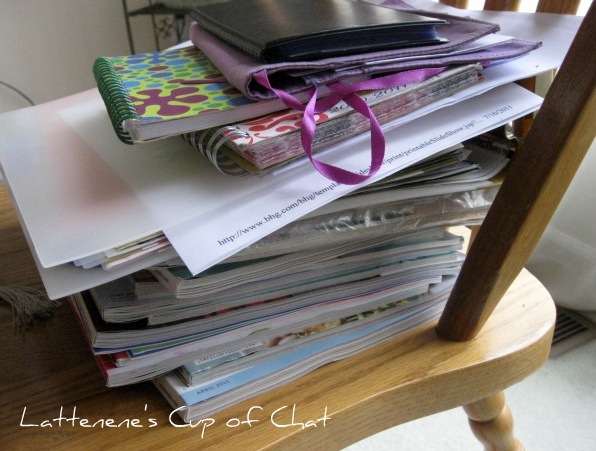 I’m being real when I say anything can be perceived as clutter if it doesn’t look organized. 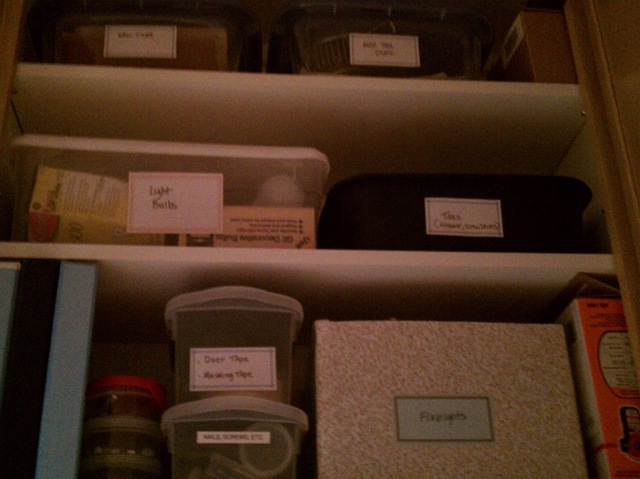 My new favorite thing to organize items is trays. I went to my favorite place to get a few ideas to share with all of you. Thank you Pinterest! Lovely in the bathroom. Hmmmm I saw one similar the other day at TJ Max for a very good price. Might have to go back. Don’t you agree that trays are awesome. 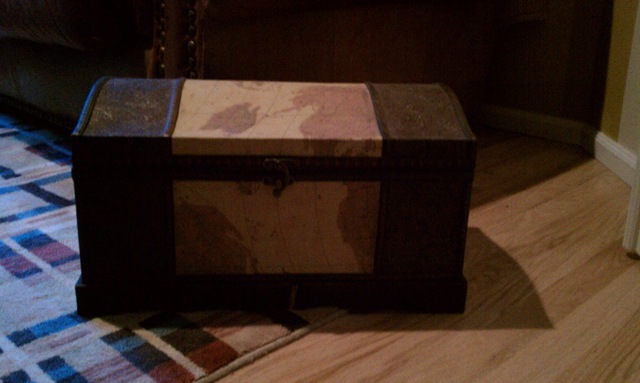 Heck, I bet I could even spray paint a cookie sheet……can you tell I’m tired and have lots on my brain. I tend to ramble when this happens. Okay, so here’s the question…What happens when this 31 day series is over? Should I continue to share organizing ideas a couple days a week on this blog? 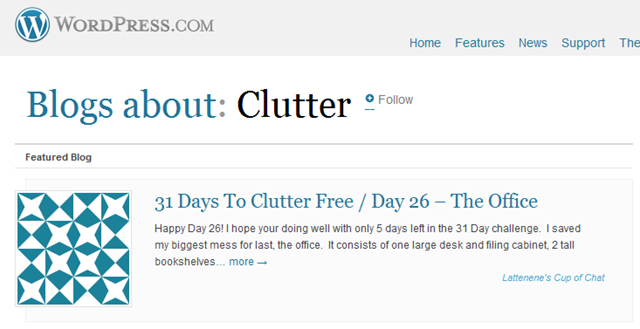 Should I create another blog strictly for organization and name it “Clutterless in Seattle”? Get it? LOL Will you still follow me ’cause I love that you do. 🙂 would love to hear your thoughts. 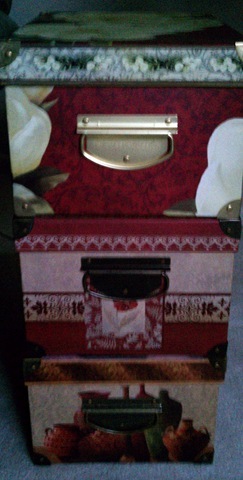 Use colored totes to match the season or event when storing decorations and label them as well. For example, I use red and green totes for Christmas, brown for Fall and Halloween decorations, turquoise for Easter, Red for Memorial Day, Labor Day, July 4th and clear for St. Pattys and Valentines Day. To go one step further with the Christmas storage I usually store decorations by room and include a picture of how it looked. Holiday decorating can be overwhelming so 30 minutes and emptying one tote can be gratifying. I have a lot of front door welcome signs and I store them in one container in the front hall closet. See HERE for previous article. Use clear contact paper on either side of something your child colored. Not only does it protect it, they can use it as a place mat. When my son was younger I did this all the time. Trust me, you can’t save everything. Lesson Learned – when your son or daughter gets a trophy for being on a team or wins an individual award quickly write on the bottom the date and what the accomplishment was., who was there, etc. That information is priceless later in life. Keep large shopping bags (like those you get at Nordstrom or Macy’s )in your closet. I keep two, one for dry cleaning and one for donate. When they get full, I make a trip. If your anything like me I’m always thinking of something I have to do and sometimes that happens in the strangest places. I keep tablets and a pencil in the bedroom and bathroom. My best brainstorms come when I’m drying my hair. LOL! It’s a rainy Sunday in the Northwest. Happy Day 23! Including today, there are only 9 days left of this series and STILL SO MUCH TO DO!!! Whew, caps always make me feel better! Although my bedroom closet is looking much better my son’s bedroom closet is in what I call a State of Disaster. He’s in his third year of college across the United States and his closet here is still crammed full of clothes, shoes, hats, etc. Confession: I’ve also added some items as I have been de-cluttering and organizing. I need to go through it today. I’m not sure if I will be tossing anything but it does need to be organized. Sometimes it just takes putting things in order to make me feel better as it tricks my mind into thinking I’ve de-cluttered. And it looks so much nicer! 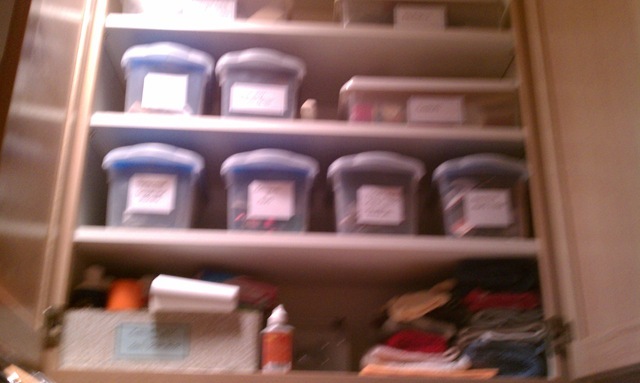 The other closet I would like to go through is in what I call the spare/guest/craft/my room. If you take the time to read about this adventure I need to tell you since I wrote the reveal post I’ve updated the look again and will be writing about it soon. It is currently on overflow and I desperately need to toss, donate, etc. 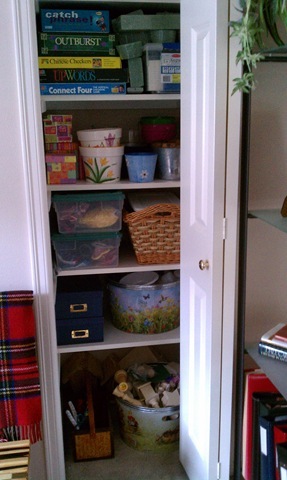 It’s full of extra craft supplies, boxes and containers to use in organizing, photos, and clothes. There’s also an occasional crutch from a broken leg and high school annuals from a 3 day weekend trip with my HS BFFs to The Beach. If I’m being real these two tasks will take a couple of days of focus as I have other things to get done to like grocery shopping, laundry, and house cleaning. I’m giving it my best effort. What area is left in your house that you have been avoiding that you need to embrace? Come on, you can tell me! It’s catch up day and that’s a god thing for me. Here in the Northwest it’s early and it is pouring rain. I’ve no excuses. 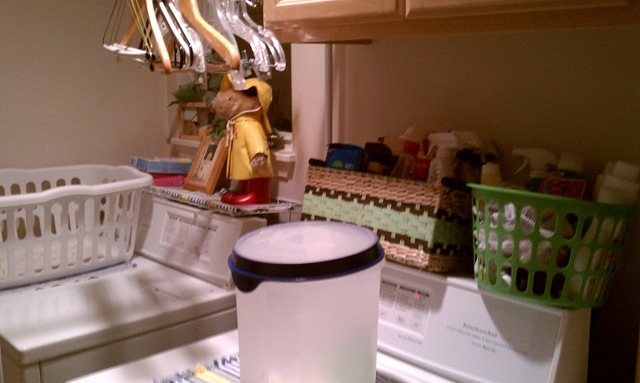 It took me 3 days to complete the de-clutter / organization of the laundry room. Well, except to paint and buy a new rug, that will come another day. Pics to come but right now I need to get Divot to the vet for shots. Do you remember all those piles you’ve been adding to since Day 1? Donate, Garbage, Recycle, Unsure? Remember those items that you tagged with post-it notes from Day 1? It’s time. The day is today to dispose or put back some of those items. What are you doing today to organize or de-clutter?